Station Passenger Numbers in Tokyo, 2016 - How much is it in Tokyo? 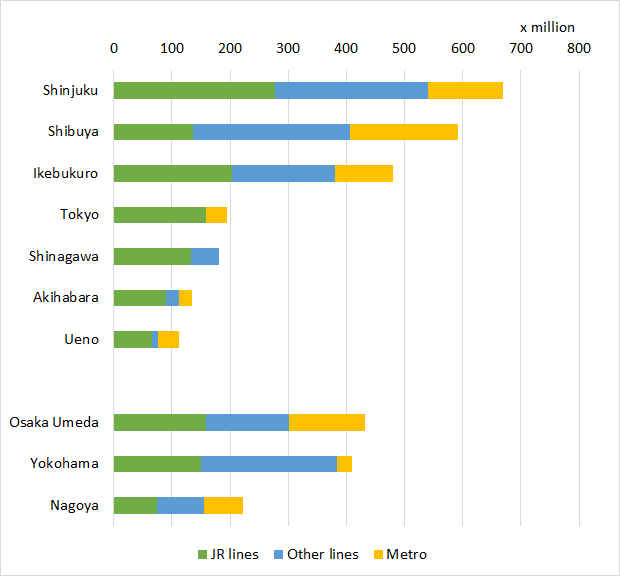 The following data show the number of passengers who used major stations in Tokyo a year, in 2016. It is the number of passengers who got on trains. It does not include passengers who got off trains. In Japan, those two types of passengers were counted separately. 654 million people used Shinjuku station in 2016 (per year). Osaka, Yokohama, and Nagoya are reference data. Source is Source is a booklet "Kurashi to Tokei 2018" くらしと統計 2018.